In the race for D.C. mayor, Councilmember Muriel Bowser has gained significant ground on incumbent Mayor Vincent Gray, who remains mired in an ongoing investigation into his 2010 campaign. 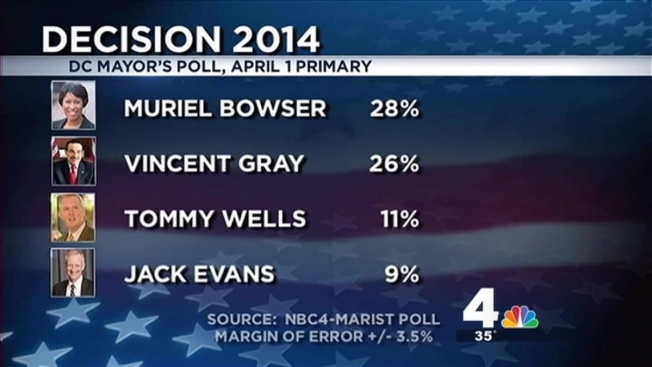 In a NBC4/Marist poll released Tuesday, Bowser and Gray are neck-and-neck, with 28 percent of likely Democratic voters supporting Bowser and 26 percent supporting Gray in the race for the Democratic nomination. "We've seen over the last several weeks just a growing energy around our campaign and what we're doing," Bowser said. "We know it's our campaign that can make sure we get a fresh start in the mayor's office." The poll shows what is becoming a two-person race in its last week, in which getting voters out to the polls will be a deciding factor -- and in which the investigation into campaign finance violations, including Gray's 2010 race, has damaged the mayor's image. A new NBC4-Marist poll shows D.C. Council member Muriel Bowser has gained significant ground on incumbent Mayor Vincent Gray in the race for D.C. mayor. News 4's Tom Sherwood reports. "It's a virtual dead heat, I think it's kind of what we expected," Gray told News4. "I'm energized and I'm working hard." NBC4 and Marist had polled likely voters last month, but repeated the poll after federal prosecutors charged businessman Jeffrey Thompson with violating federal and D.C. campaign laws. Federal prosecutors said Gray knew that his 2010 campaign received money donated illegally. Gray has not been charged in the campaign finance investigation and has strongly denied any wrongdoing. In the previous poll, Gray led Bowser (Ward 4) by eight percentage points. Among the other contenders, Councilmember Tommy Wells (Ward 6) is now supported by 11 percent of likely voters; in February, 12 percent supported him. Councilmember Jack Evans (Ward 2) polls at 9 percent now, down from 13 percent in February. In the most recent poll, Busboys and Poets owner Andy Shallal is supported by 4 percent of likely voters, Councilmember Vincent Orange (at-large) by 4 percent and Reta Lewis by 2 percent. Less than one percent of likely voters support Carlos Allen. However, the race remains changeable: 15 percent of likely voters said they were undecided and 14 percent said they might change their vote when it comes time to go to the polls. The results are similar to a Washington Post poll also released Tuesday, which showed Bowser supported by 30 percent of likely voters and Gray by 27 percent. Bowser, meanwhile, is a slightly stronger candidate against Councilmember David Catania, who has announced that he will run as an independent in a general election this fall. In a Catania/Bowser race, 46 percent of registered D.C. voters said in the NBC4/Marist poll that they'd support Bowser, compared to 26 percent that would support Catania and 28 percent that are undecided. Against Catania, Gray has the support of 43 percent of voters and Catania has the support of 37 percent of voters. In that matchup, 20 percent of voters are undecided. COMPLETE election coverage on Decision D.C. 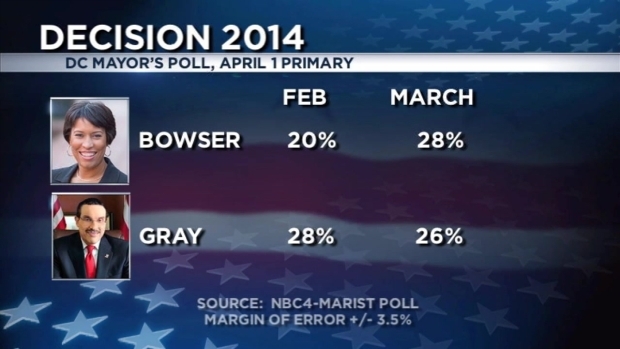 Uncertainty about Gray has increased, the NBC4/Marist poll shows, and Gray's approval rating has fallen. This time, only 34 percent of adults in D.C. said that, if Gray wins the nomination, they will definitely vote for him. That's down from 43 percent in last month's poll. Nearly six in ten residents -- 59 percent -- said it was time to elect someone else to the job. Meanwhile, the percentage of D.C. residents who said they approve of the job Gray is doing in office has fallen from 56 percent last month to 50 percent now. The percentage of people who say they have a favorable opinion of the mayor has fallen from 45 percent to 35 percent. The campaign finance investigation led many residents polled to revise their opinions of Gray; in this poll, the number of people who said they believed the mayor did something illegal jumped from 24 percent last month to 29 percent this month. Gray's base remains strong, and there are signs that the news of the investigation may be solidifying his base. Nearly seven in ten of those who support Gray, or 69 percent, strongly support the mayor, while 49 percent of likely Democrats for Bowser are firmly in her corner. Last month, 53 percent of Gray’s backers said they were strongly committed to him. Fifty percent of Bowser's backers said they were strongly committed to her. Gray remains the leader among black voters, with 43 percent of likely black voters supporting him. Bowser is now in the lead among likely white voters, with 36 percent of those polled. Bowser has doubled her support among white voters since the last poll. For this poll, 1,279 adults were interviewed from March 19 through March 23. Of those polled, 40 percent of adults were reached by cell phone, including 38 percent of registered voters. The poll has a margin of error of plus or minus 2.7 percentage points among D.C. adults, 2.9 percentage points among D.C. registered voters, 3.5 percentage points among D.C. Democrats and 4.7 percentage points among likely Democratic voters in D.C.